Peptide competition experiments confirmed that the antibody recognises specifically methylated R17 in H3 and not unmethylated H3 or methylated R3 in H4 (see figure 1). In whole cell extract the antibody recognises specifically only the methylated histone H3 protein band (see figure 2) Further, the antibody doesn't crossreact with the C-terminal methylation sites of CARM1 in histone H3. In IHC on paraffin-embedded sections of human tonsil, the antibody shows nuclear staining across most nuclei. Slight batch to batch variation is observed, but no more than 50% cross reactivity with symmetric di methyl R17 peptide is allowed. Synthetic peptide within Human Histone H3 aa 1-100 (asymmetric di methyl R17) conjugated to Keyhole Limpet Haemocyanin (KLH). The exact sequence is proprietary. 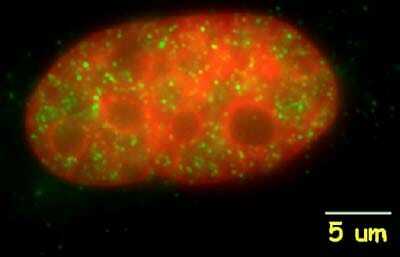 This antibody gave a positive signal in HeLa Histone Preparation Nuclear whole cell lysate. 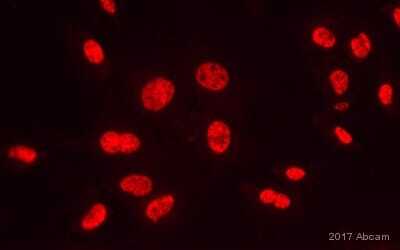 It also gave a positive result in MCF7 cell line. The nuclear hormone receptor co-activator CARM1 has the potential to methylate histone H3 at arginine residues in vitro. The methyltransferase activity of CARM1 is necessary for its co-activator functions in transient transfection assays. However, the role of this methyltransferase in vivo is unclear, given that methylation of arginines is not easily detectable on purified histones. This antibody recognizes methylated arginine 17 (R17) of histone H3, the major site of methylation by CARM1. Bauer et al (2001) have shown by using this antibody that methylated R17 exists in vivo. Chromatin immunoprecipitation analysis shows that R17 methylation on histone H3 is dramatically upregulated when the estrogen receptor-regulated pS2 gene is stimulated by estradiol and TPA. Coincident with the appearance of methylated R17, the CARM1 methyltransferase is found associated with the histones on the pS2 gene. Together these results demonstrate that the CARM1 methyltransferase is recruited to an active promoter and that CARM1-mediated methylation of histone H3 at R17 takes place in vivo during this active state. Our Abpromise guarantee covers the use of ab8284 in the following tested applications. PepArr Use a concentration of 0.002 - 0.0002 µg/ml. ICC/IF Use a concentration of 0.1 µg/ml. Additional bands at: 55 kDa, 60 kDa, 90 kDa. We are unsure as to the identity of these extra bands. All batches of ab8284 are tested in Peptide Array against peptides to different Histone H3 modifications. Six dilutions of each peptide are printed on to the Peptide Array in triplicate and results are averaged before being plotted on to a graph. Results show strong binding to Histone H3 - asymmetric di methyl R17 peptide (ab16935), indicating that this antibody specifically recognises the Histone H3 - asymmetric di methyl R17 modification. ICC/IF image of ab8284 stained MCF7 cells. The cells were 100% methanol fixed (5 min) and then incubated in 1%BSA / 10% normal goat serum / 0.3M glycine in 0.1% PBS-Tween for 1h to permeabilise the cells and block non-specific protein-protein interactions. The cells were then incubated with the antibody (ab8284, 0.1µg/ml) overnight at +4°C. The secondary antibody (green) was ab96899, DyLight® 488 goat anti-rabbit IgG (H+L) used at a 1/250 dilution for 1h. Alexa Fluor® 594 WGA was used to label plasma membranes (red) at a 1/200 dilution for 1h. DAPI was used to stain the cell nuclei (blue) at a concentration of 1.43µM. 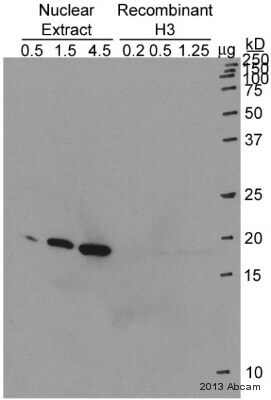 Western blot - Anti-Histone H3 (asymmetric di methyl R17) antibody (ab8284)Taken from Bauer et al, (2001). 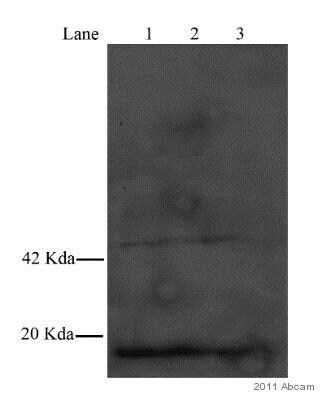 Total U2OS cell extract was western blotted using the anti-Me-R17H3 antibody. The asterisk indicates methylated histone H3. The left panel shows presence of core histones (indicated on the left) by Coomassie Blue staining. Molecular weights are indicated on the right. A dot blot was performed using unmodified peptide (lane 1), Histone H3 mono methyl R17 peptide (lane 2), Histone H3 asymmetric di methyl R17 peptide (lane 3) and Histone H3 symmetric di methyl R17 peptide (lane 4). 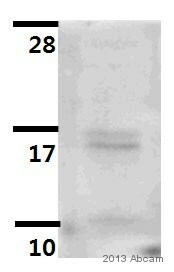 The dot blot indicates that ab8284 is specific to Histone H3 asymmetric di methyl R17. ab8284 was used in immunohistochemistry with paraffin embedded sections of human tonsil, using DAB as a chromogen (brown). Counterstaining of nuclei was performed with haemotoxylin (blue). Staining is seen confined to the nucleus.